Andy Maloney moved up one place on the final day to take Bronze at the 2012 Audi Laser World Champs in Boltenhagen, Germany. This follows his silver at the Semaine Olympique Francaise World Cup a few weeks ago, making a stunning European tour. Andy's comment: It was a very successful first trip to Europe for the season, and I am stoked with my results and some of the improvements in my speed, tactics and all around racing ... Thanks to everyone for following my progress, and for the support! Australian Tom Slingsby lead throughout the regatta and was able to sit out the last race. Sam Meech was the second NZL having a great regatta for 17th. Andrew Murdoch moved up to 25th he won the final race. Other NZL sailors were Thomas Saunders in 86th and Micahel Cate 101st. Men in Black - Sam Meech, Andy Maloney, coach Mark Howard and Andrew Murdoch. Andy Maloney and Olympic rep Andrew Murdoch finished 2nd and 3rd at the 2012 Semaine Olympique Francaise World Cup at Heyres in France. In a 106 boat fleet both sailors were almost consistently in the top 6, sharing 5 firsts, 4 seconds and 5 3rds across the 10 races. Andrew Murdoch maintained his 3rd spot with a 5th in the medal race. In the 9th race Andy Maloney had his worst result, a 17th he could drop. This didn't seem to shake his confidence, he went into the medal race in 4th and sailed a 2nd to take 2nd overall. German sailor Phillip Buhl won the event. Australian Tom Slingsby was at the top of the leader board for much of the regatta but slipped to 5th with a DNF in the medal race. Our third NZL also impressed. Youth sailor Thomas Saunders was consistently in the top 20, including two 4ths. He finished 40th, near the top of the silver fleet. Next stop Boltenhagen Germany for the Audi Laser World Champs 2012 from 4th to 10th May. 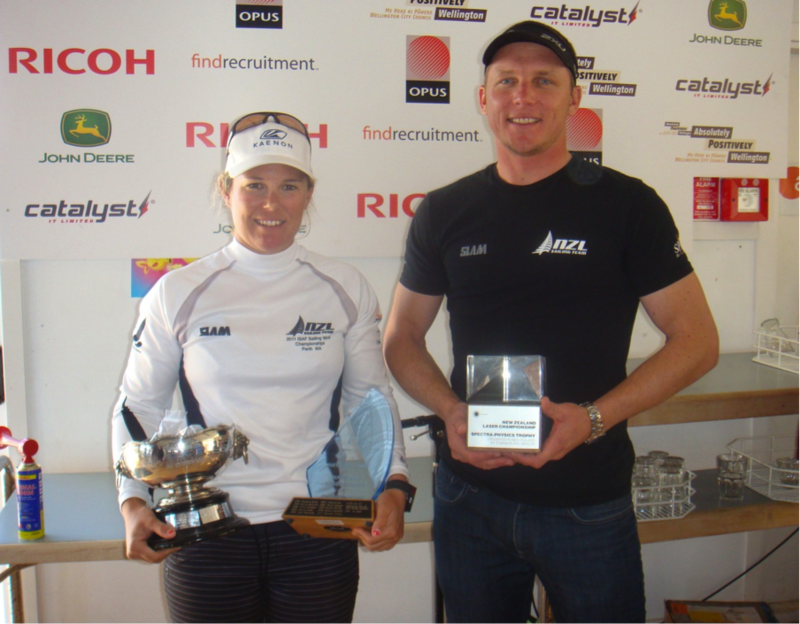 Winds were light for the Auckland Masters Laser Champs at Tamaki on 21st April. Garth did well to get us 2 races. But we need 4 for a series. Round 2 at Tamaki on Saturday 28th - 2:15pm first race. NZL Team members with their 2012 Masters Worlds cubes. Pete Thomas (3rd Grand Master Radial), Mark Orams (1st Master Radial), Scott Leith (1st Apprentice Radial), Andrew Dellabraca (4th Master Standard), Mike Keeton (1st Grand Master Radial). 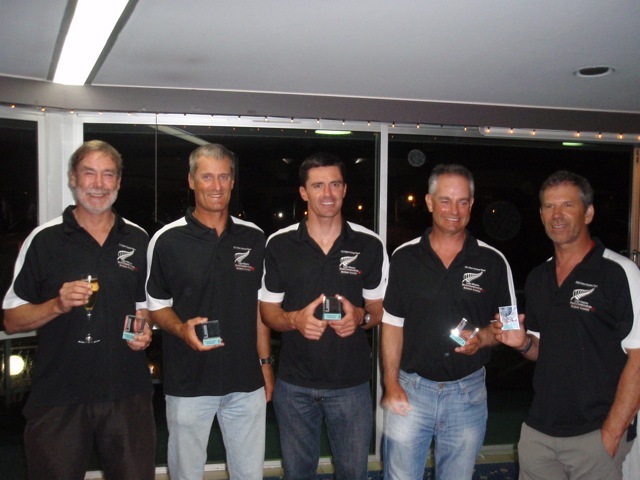 The 3 new world champions were just part of the great form shown by the NZ team at the 2012 Laser Masters in Brisbane. Scott Leith won the Radial Apprentice for the 3rd year in a row. But this one was sweet as he convincingly beat Richard Bot, a very good sailor from Sydney who had beaten Scott when they first met at the Worlds in the 2009 worlds in Nova Scotia. In the Radial Masters past open world champion Mark Orams was battling a heavier Greg Adams from Brisbane in the strong winds during the first half of the regatta. But Mark finished with 5 staight wins in the lighter second half to clinch the title by 4 points. Hamish Atkinson from Christchurch finished 7th. Mike Keeton will be especially pleased with his first world championship win in the Radial Grand Masters. He has shown us glimpses of good form for years, but this time strung it all together on the international stage to beat Adam French from Brisbane. They were 1 point apart mid regatta, but Mike stayed consistent on the final day to stretch away to a 7 point lead. Consistency also paid for Pete Thomas who took third, winning the final race to be tied on 34 points with 2 other sailors - then getting the 3rd on countback. Bruce Jones from Wellington will have been happy with his 8th. Despite being concerned he was too heavy, Bob Blakey came 6th in the Radial Great Grand Masters. So we will ignore that excuse from now on. Over on the Standard course, Apprentice sailors Kent Copplestone from Foxton Beach and Rob Woodward from Wellington had a epic finale. They were 6th and 5th in the final race, leaving them tied on 53 points. But on countback Kent was 4th overall and Rob 5th. Andrew Dellabarca had another great worlds to finish 4th in the strong Standard Master fleet. In the Standard Grand Masters Nick Page had a regatta of two halves. He did well in the heavy half but faded to 10th in the light shifty conditions. Despite training exclusively on Lake Pupuke. Read more for all NZL Results & photos. A few of our NZ Masters sailors sailed the Aussie Master champs in Brisbane as a preliminary to the World Champs at the same location starting Saturday 10th March. Scott Leith made a clean sweep of the Apprentice Radial Division. Ed Tam backing him up in 3rd. Mike Keeton convincingly won the Grand Master Radials. Mark Orams was 2nd in the Masters Radial, racing hard against local Aussie Greg Adams. Hamish Atkinson from Christchurch in 8th. Well it blew like hell on the Saturday. On the Tamaki YCs start boat Garth measured 2 solid minutes of the souwester at 30 knots during the the second race. Then his arm got tired. It didn't stop him setting 3 looong races into the tide. He has quite a cruel streak does Garth. Sunday was lighter, but more to the South and still shifty. Scott Leith cleaned up the Radials mens (again, boring, whatever). At least he was properly pushed by Mark Orams in 2nd. Sara Winther took the female radials, with a cameo appearance by second place Jo Aleh to give the event an Olympic flavour. Our dear leader Nick Page gets his name on the Standard cup, alongside some quite illustrious company. And 2nd placed Ken Atchison made his trip up from Hamilton worthwhile. He often comes up and we appreciate the effort. But for some of us Tamakis famous Roast Beef Sandwiches were the weekends highlight. Thanks for all the support and for following my progress! I am looking forward to a great year training and competing! And another update from Andy after winning the OKI 24 Hour. Nationals Report from Edmund Tam at Worser Bay BC. 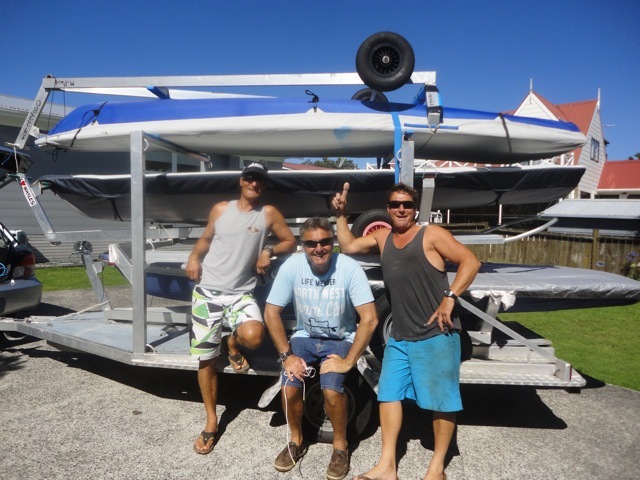 NZ Laser glitteratti and past World Champions Mark Orams, Murray Thom and Mark Page preparing to head south for the highly enjoyable NZ Laser Champs hosted by the hospitable Worser Bay on Wellington. In a rare moment Mr Page manages to upstage Murray with a finger fresh from A&E. Apparently the result of a workplace accident, not a domestic dispute as originally reported. Despite the discomfort Mark sailed all races although the finger was deemed a shipping hazard by the Wellington Harbour Master. See how they went, along with all the rest of us.